I’ve been a slacker when it comes to writing lately. The truth is that I’ve been having too much fun walking in the Smokey Mountains and along the South Carolina shoreline that writing has taken a back seat. 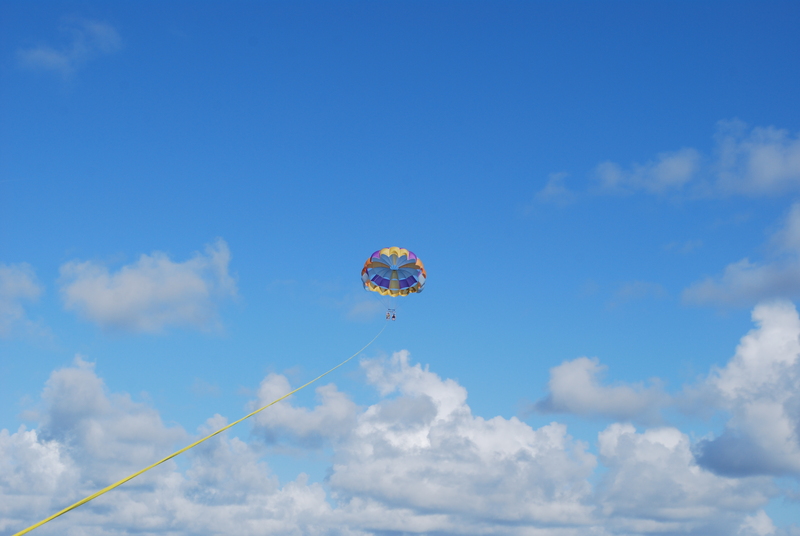 And lest I forget, I did a little parasailing too. I’ve also read some interesting books lately, including Leon Uris’s Mila 18 and QB VII. In the latter, Ben Cady, the protagonist talks about what it takes to be a writer. I loved reading that so much that I highlighted the passage on my Kindle and have been thinking about it just about every day. So FINALLY, today at 4:33 p.m., I’ve snuck (?) away to the FROG to write a little. First, a blog about “just doing it” and then some major rewrites of an e-book about what community college students need to know in order to be successful. So don’t try to tempt me with another trip to the beach (my husband has already tried that), the movies, or lunch. And no, I don’t want to go parasailing again just yet. I just want to seclude myself upstairs in our little bonus room and apply the seat of the pants to the seat of the chair…or, in my case, couch. As my sweet sis has been known to say, talk is cheap. It’s time for action. This entry was posted in writing, writing life, writing tips and tagged writing, writing challenges. Bookmark the permalink.